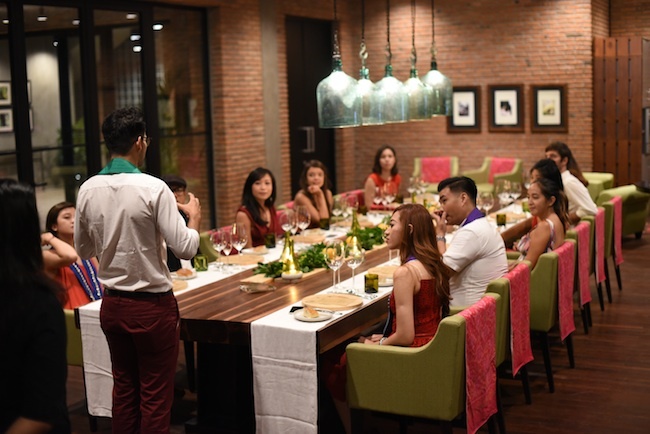 On Friday 30th of September 2016, after a long hiatus, the Bailliage de Bali Jeunesse de Legian finally assembled once again for an evening of fine food, wine and camaraderie. 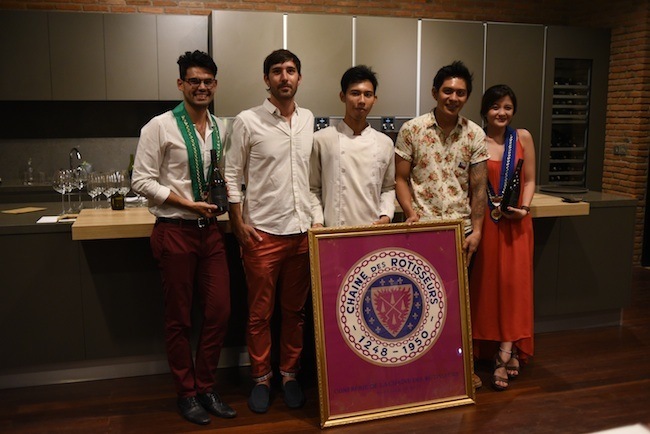 The evening was host to only 12 guests, as the event extended beyond the usual Chaine gathering and aimed to bring this younger group into a greater appreciation of food and wine. Members and non-members came dressed in red and white, inspired of course by the colours of wine, on which the night’s events were heavily centred. The venue too was appropriate, the new building of Hatten Wines, Bali’s first ever winery and indeed a legendary institution on the island. 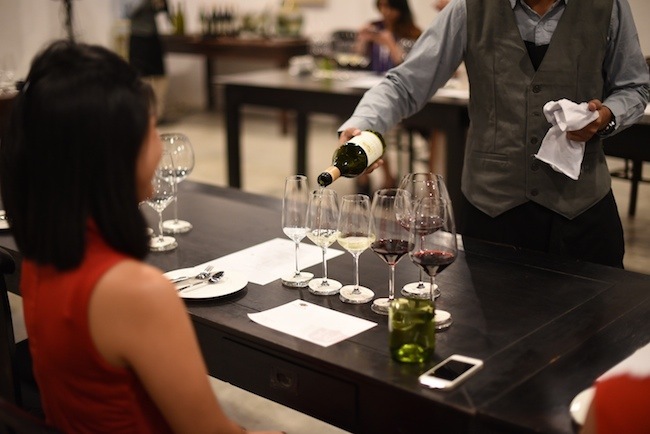 This special event was split into two separate agendas, first an intriguing ‘Wine Pairing Experience’: a signature experience created by Hatten Wines’ Sommelier, followed by a wine-paired dinner in the building’s exquisite Private Dining Room with Gaggenau. Mingling and gathering on the second floor, guests first enjoyed glasses of Hatten Wines’ very own new Reserve Brut Sparkling, a Premium Chardonnay and Pinot Noir wine made in the traditional méthode champenoise. Finally, the first phase of the evening commenced and the members entered the ‘Two Islands Tasting Room’. 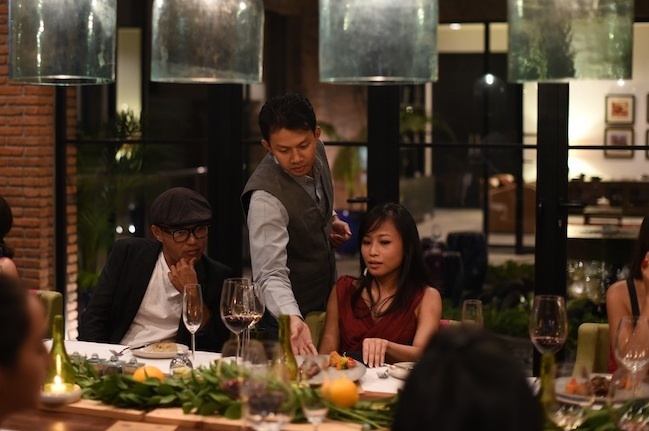 When all were seated, the group was welcomed by the Sommelier and Training & Development Manager of Hatten Wines, Ms. Kertawidyawati, who is also the creator of the unique wine pairing experience that was about to unfold. With 6 glasses laid out in front of each person – 1 sparkling, 2 whites and 3 reds – class began. Ms Widya started by going through the basics of wine tasting, explaining to the group everything from colours to tannins and aromas. However, it is really the second part of the experience that was the most exciting, as plates consisting of 3 simply cooked proteins (beef, chicken and fish) and 4 sauces were brought forward. Now, each wine, each protein and each sauce were paired in different combinations in a truly entertaining episode of tastings. Pairings ranged from sparkling wines with fish and Indonesian ‘rendang’ curry sauce to white wines with beef and garlic butter. The question is of course, why? Well, the idea of the tasting experience is really to challenge convention, especially as new world and latitude wines and Asian flavours don’t always fit into the archetypal pairing, a thick ‘beef rendang’ may very well pair nicely with a sweet white. Just as important however is that the experience taught the group that pairings are personal; people grimace or smile to different combinations and really, that’s okay. 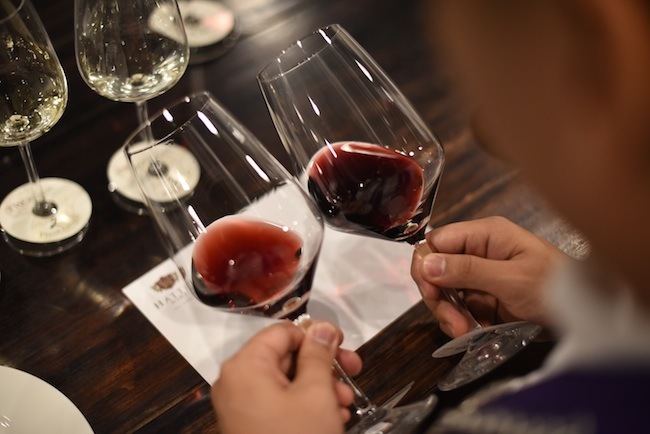 Yes, understanding what makes a good pairing is important, but so is nurturing the confidence to make your own decision and trust in your own palate – particularly significant for young, budding wine drinkers. 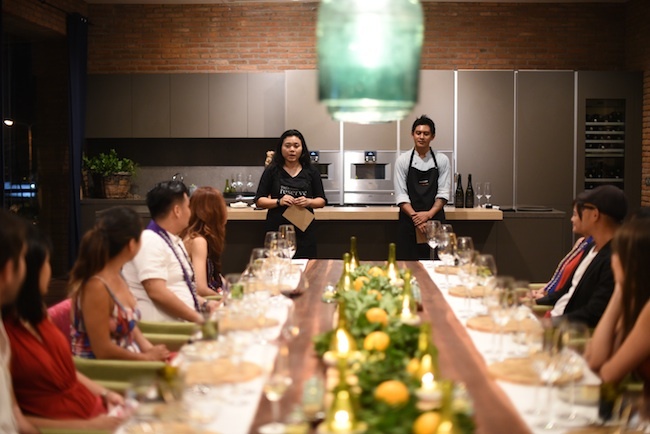 Having been educated, enlightened and entertained in Ms.Widya’s wine classroom, guests continued into the evening’s second agenda, the 4-course dinner in the Private Dining Room with Gaggenau. The room took everyone by surprise; elegant, but warm and welcoming, with one long wooden table waiting at the centre of the cozy room. The atmosphere was not unlike a family Christmas dinner. The food for the evening was prepared by Hatten Wines’ in-house chef, Chef Agus, who’s menu holds as much philosophy as it does quality; each dish contains an ingredient that comes from the story of Hatten Wines, from grapes to raisins, vine leaves to Arak and Brem. 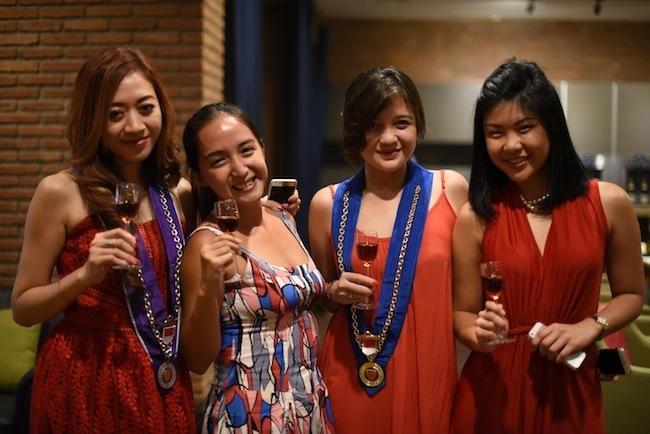 The wine pairings, introduced by Ms Kertyawidyawati, were sponsored by Hatten Wines, who showcased their newest range, the Two Islands Reserve. The Reserve range actually features Australian grapes, imported to Bali where they are vinified. Hatten Wines’ winemaker, James Kalleske, was at the dinner himself as a member of Chaine Jeunesse. He introduced each of his created wines before every dish. – The dinner began with an entrée of Pumpkin Purée, which featured a selected seasoning of Pemuteran Artisan Sea Salt, farmed on the shores of Bali North Coast. This was paired with the Two Islands Reserve Chardonnay. – To awaken the palate before our main, a Trou Normand à la Bali was served. Rather than the usual brandy or calvados, Chef Agus made his own granité using Hattens Wines’ Jepun Sparkling Rosé and kemangi (lemon basil). 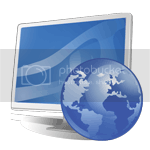 – The main course featured an incredibly rich roasted duck breast with vigneron orange sauce, with simple sides of broccoli, carrots and William potatoes. The duck had been marinated in Two Islands Reserve Shiraz, which was also the pairing of the dish. – To finish, Chef Agus served a White Chocolate Panna Cotta with Dewi Sri ‘Brem’ reduction sauce. Brem is a low-alcohol Balinese rice wine. The dessert was paired with Jepun Sparkling Rosé. After the fun, intimate dinner, it would be fair to say that all guests had been fully satisfied by the events of the evening. But, Hatten Wines – the graceful hosts that they were – had one more treat for the Jeunesse members. It was their award-winning Pino de Bali, a 5-years oak-matured dessert wine, made using the French Pineau des Charentes method. Whilst the evening was host to only 12 guests, the event went above and beyond their expectations. From the knowledge gained through the wine-pairing experience, to the sincere appreciation of each dish and its philosophy and of course the truly intimate nature of the Private Dining Room with Gaggenau, the core Chaine values were effortlessly met. 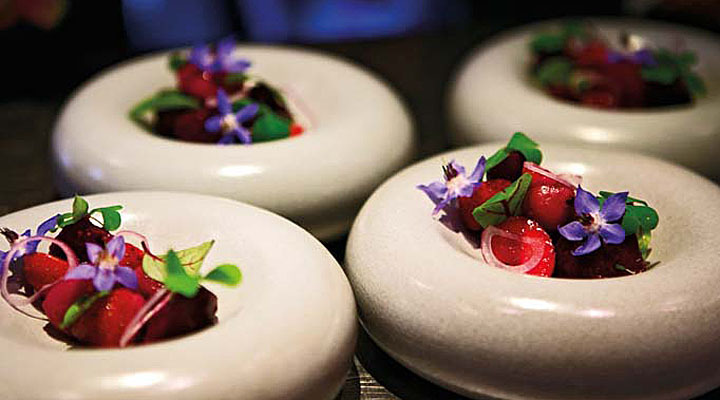 The Jeunesse events are aimed to be more than just dining; they are environments of nurturing and improving the ‘art of dining’ amongst a new generation. Once again, the event could not have been made possible without the kind support and sponsorship of Hatten Wines and the Two Island Reserve wines. Chaîne Luncheon at Locavore : Felicitations or Lamentations?